That being said, they also have some unique recipes to try. 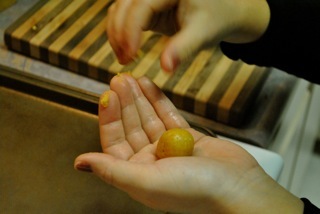 Take, for instance, Zuzana’s Power Balls. While the text of the post is a little inappropriate (ha), I loved the idea of having a nutrition-packed snack to have along with breakfast (or in the middle of the day when my energy gets low). 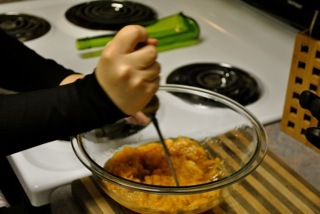 Zuzana’s recipe calls for almond flour (which can be very expensive), and also uses carrots. While I love carrots, sweet potatoes added a little special something to this recipe, and we always have a ton of them in the house. Do they taste like cookies? Nah, but they’re something to grab (on the go!) that is not unhealthy or highly processed! Did you know? 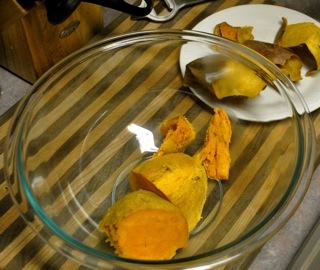 There IS a difference between yams and sweet potatoes. Usually in the US, the names are interchangeable. 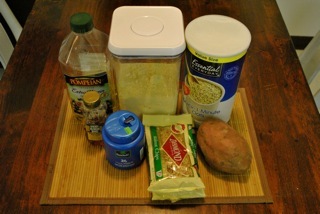 However, when I came up with this recipe, I was lucky enough to get some real, white yams at an international market. For the curious, you can read all about the differences here. 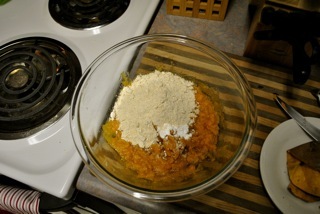 Natural honey, coconut oil, chickpea flour, oats, a (rather large) sweet potato, and chopped nuts (we chose walnuts). The full ingredient list can be found at the end of this post. 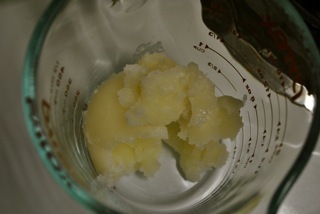 and coconut oil (5-6 tbsp, melted). Looks appetizing! (Not.) I know. Step 3. 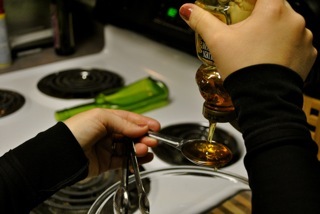 Mash up your honey/oil/potato mixture (and make sure to get an action shot if you’re taking pictures). On a side note, I got this antique (and clearly functional) potato masher at an antique store in Rehoboth for $6. I use it all. the. time. I figured if it lasted as long as it did before I bought it, it was fully worth the investment. Step 4. Once everything has been mashed to an even consistency, add in 3 rounded teaspoons of baking soda, 2 cups of oat flour (I ground whole oats using my food processor) and 1/2 to 1 cup of chickpea (or almond) flour. 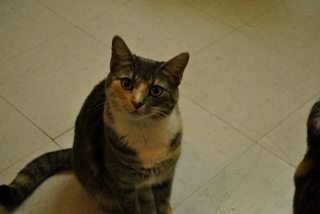 …while one of my your cats looks on in awe. Step 5. 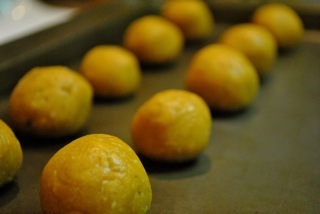 When the dough is ready, fold in 1/4 cup of chopped nuts. I thought to post a picture of the final product but…really, they just look like this. Haha. Enjoy! 1. Combine flours and baking powder, mix well. 2. 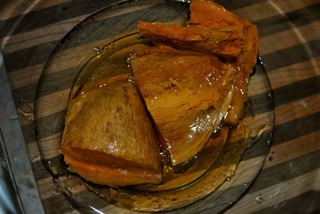 In a separate bowl, combine mashed yam, honey, and coconut oil. Mix well. Let us know when you try it out! Did you get a chance to try these when I made them in Newark? I’m *still* working on getting back to the gym… haha.